More and more loses the SAP GUI for Windows his unique position as primary UI and also more and more are desktop applications replaced with web applications. The SAP GUI for Windows offers for automation approaches the SAP GUI Scripting, a consolidated and technical reliable way. For web browser wrotes Former Member in his great blog about START (Simple Test Automation for Regression Tests) an UI Automation Framework to automate the testing of application. START bases on Selenium WebDrivers. So I think it could be advantageous to combine SAP GUI Scripting and Selenium. So I advanced my Scripting Tracker to create also Java code, to offer the possibilty to combine SAP GUI Scripting on this language platform. To use SAP GUI Scripting with Java you need the Java COM Bridge (JaCoB). For the web activities I use in my context the chrome web driver, an x86 application, because I use the Chrome browser. So it is necessary to use the x86 (i586) version of the JDK, also for the SAP GUI for Windows. To record the activities on the web browser I use Firefox with Selenium IDE. You see it is a very heterogeneous development environment. But after all, it works. 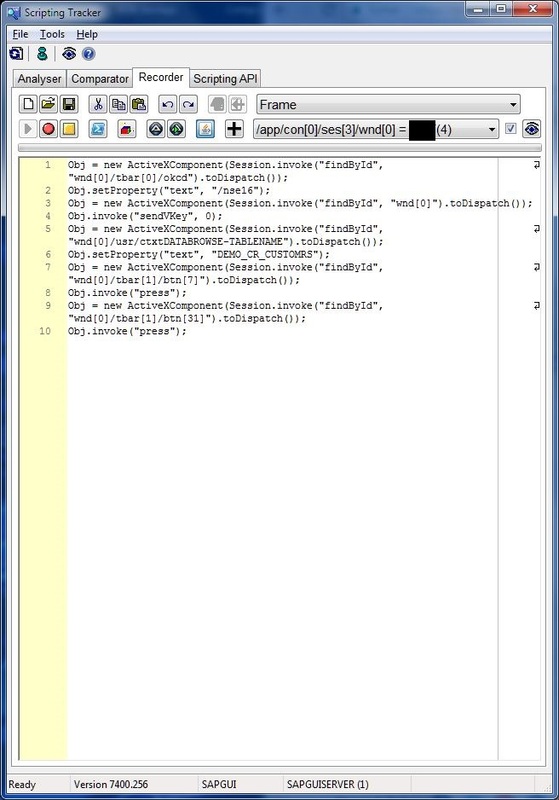 Here an example code how to combine SAP GUI for Windows activities with any activities in a web browser. 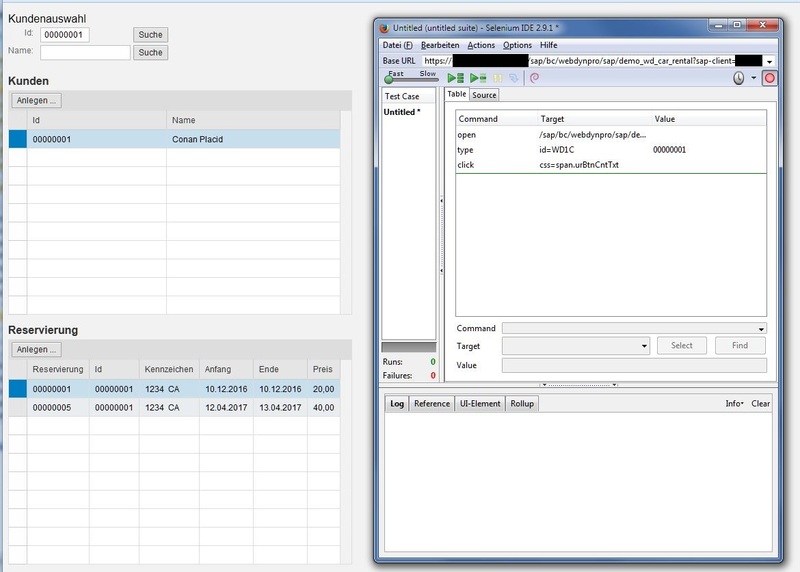 In the example I combine information from the TAC SE16 from the table DEMO_CR_CUSTOMRS with a web dynpro application DEMO_WD_CAR_RENTAL – this is not really useful but shows the horizons. 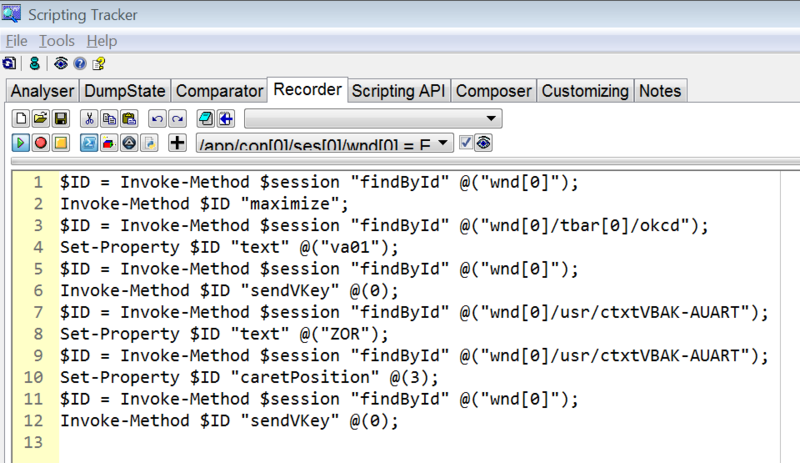 A longer time ago I wrote here about the possibility to use PowerShell with SAP GUI Scripting. Selenium offers, besides Java, also dotNET libraries. On this way it is possible to combine SAP GUI Scripting with the WebDriver also on the base of PowerShell. Here the same example in PowerShell. 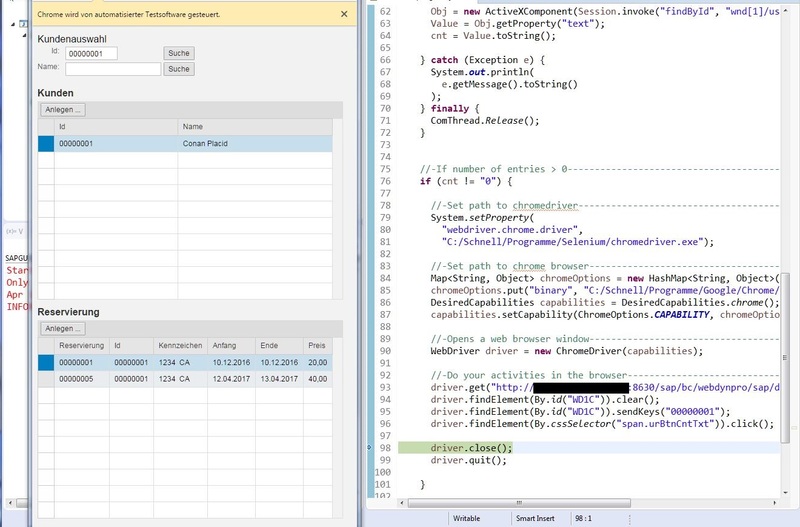 $application = Invoke-Method $SapGuiAuto "GetScriptingEngine"
$Value = Get-Property $ID "text"
On this ways is it possible to combine SAP GUI Scripting with e.g. WebDynpro or UI5 applications. So you can reach a higher integration level in your automation approaches. Thanks for this.I was able to login and search for some objects in SAP UI.Now i am stucked in reading data from a grid.After searching system generate a grid.Now i want to read the data from the grid . I can click on grid cells and rows but i can not read the data.How to read the data from grid. this returns an exception.I have tried with different row and column id’s as well. Exception – Method threw ‘com.jacob.com.ComFailException’ exception. Thanks for the reply.Appreciate it.The above code also returns the same error.But I am lucky enough to come across a code which worked for me. The above code returns the row 1's objectid columns value. Sorry for interrupting again. Have you ever done automation for SAP MDM -SAP Master Data Management. Would appreciate you thoughts and Ideas on it. no, unfortunately I have never worked with MDM, so I can’t give you hints, sorry. I wanted to automate SAP GUI transactions. this blog gave me many useful info. I used the same Logon script shared on this blog but its not working. I used the same Logon script shared on this blog but its not working. Any specific changes to be done? the script does not throw any error after resolving dependencies. Hi – Can we use name for identifying the object instead of FindByID always? Please advise. welcome in the SAP Community. The examples shared are VB, any reference how that would be in Java? One more help.. Is there any reference link which I can refer to? Currently, I’m seeing issues for SAP grid where the ID would end at shell and post that, i need to write functions/methods to access the content. Thanks Stefan, will check the code shared. Hi Stefan – I’m trying to scroll down on MM43 but sendVKey 82 is not active/configured on this screen. Basically I’m trying to take a screenshot on the attributes which are not visible. Could you please suggest if there is any alternate method to scroll down to a specific field on MM43? it would be great if you ask this as a new question in the forum and not as comment of this blog. I tried running the code mentioned in the blog but I am getting following error. Could you please help me. 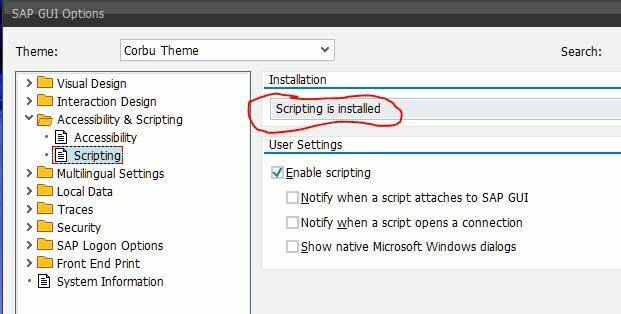 is the SAP GUI Scripting installed on your computer? do you use x86 version of Java? SAP Rot Wrapper is an x86 version and it is not possible to use it with x64 Java version. Thanks Stefan. I tried with x86 version of Java. It worked! But I do not see the java option to select for the coding. Could you please help me here. I disable the Java support with release 4 of Scripting Tracker. Java is since version 9 available only as x64 version. The only way to get access to the Windows Running Object Table (ROT) is via an x86 library, as I described above. So nobody has a chance to use this method with an actual Java release. From this perspective I see no reason to support Java furthermore. But is there any possibility of getting any of the versions of Scripting Tracker below release 4? Because I wanted the Java Scripting Engine which was more helpful as we do the SAP Automation using Java and can be integrated with the Hybris web apps as well which are automated using Selenium. But if same I have to do it with Java then What should be it.